I love using Pinterest as a tool to gather together interiors inspiration when I’m thinking about redecorating a room in my own home, and one of the looks I’m most often drawn to is modern rustic style interiors. The modern rustic look, as created by VictoriaPlum.com Customer Jacqueline from Cumbria. Modern rustic is an interiors style that reflects a desire for a simpler, more authentic way of life. Celebrating natural materials, sensual textures, and organic beauty, this is a look that’s relaxed, welcoming and unpretentious. It’s a soothing, calm, soulful style that’s quite minimal – more pared back and carefully edited than a traditional country or rustic look. In the modern rustic interior, everything is thoughtfully considered and each object has to ‘earn’ its place. The use of natural materials is perhaps the most important element when creating a modern rustic bathroom. Think reclaimed timber, stone, slate, linens, cottons, beaten up leather, terracotta, stoneware, seagrass and wicker. Textures are rough or unfinished and rich in natural grain or patina and natural imperfections add character and interest. Choose a neutral, earthy colour palette that echoes the materials you are using. Opt for off whites, charcoal grey, soft beige and other subtle tones with a chalky, matte finish. Start by taking inspiration from any architectural features and natural materials already present in your home. 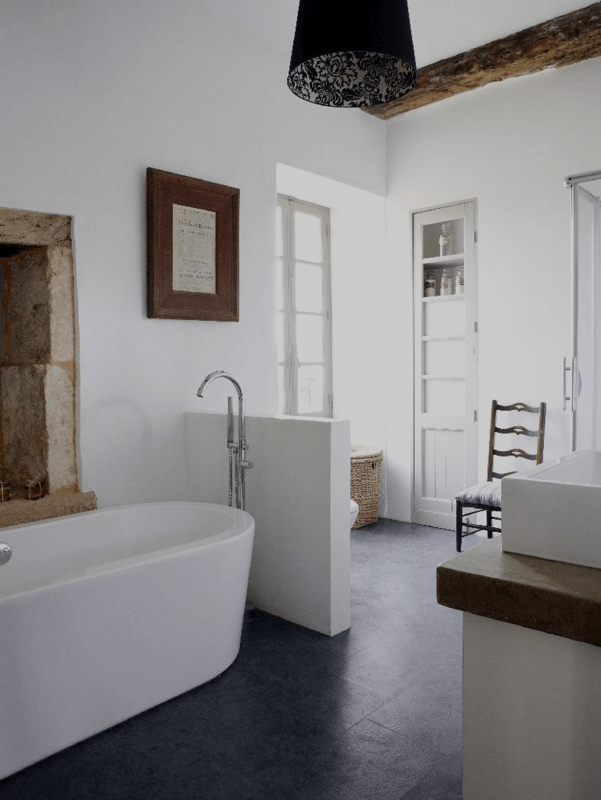 Contemporary baths and basins will look beautiful against a backdrop of exposed stone walls, old timber beams and original slate or flagstone flooring. The contrast between the old and the new will feel fresh and modern, but at the same time soothing and grounded. When choosing baths and basins for a modern rustic bathroom steer clear of hard edges and sharp lines and opt instead for understated contemporary designs in softer, more organic shapes. A freestanding bath like the Positano would be a good choice for this type of look if you are lucky enough to have a generously sized bathroom – it’s gently curved ovoid shape is soft, inviting and cocooning. 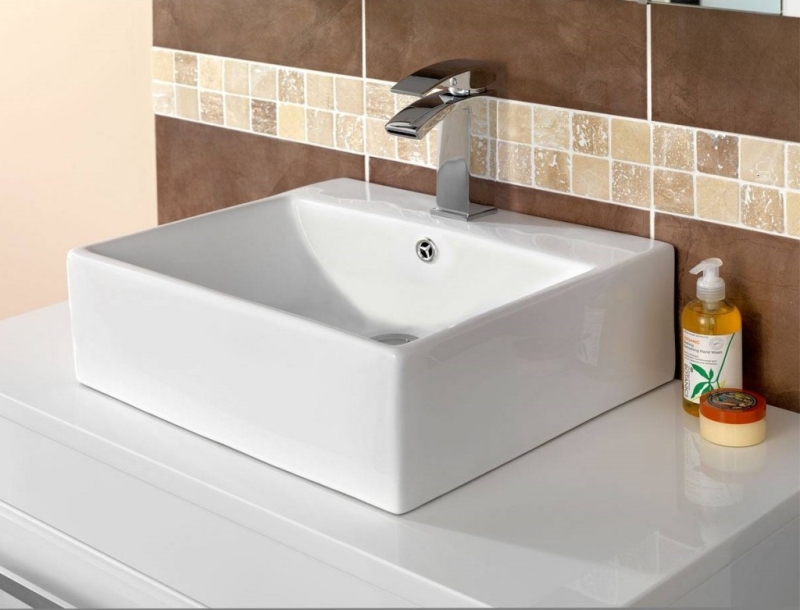 And a simple trough style counter top basin like the Quadra would look great on top of a piece of roughly finished recycled wood or slate. Choose simple, unfussy taps and hardware. Modern, minimal designs will work better here than anything too ornate, traditional or “heritage” inspired. If you like this style and want to track down further inspiration you might enjoy Emily Henson’s book “Modern Rustic”, which shows you how to translate this look beautifully to every room in the house. Give your home its very own rustic makeover, with our great tips for a country style home. Looking for a unique way to give your bathroom a style-edge? Shabby chic is a classic design choice with plenty going for it, but just how do you go about bringing it into the bathroom?